With 35-hour battery life, IP67 certification, and great sound, the Fugoo Sport XL is officially one of the best speakers we've reviewed to date. This is a bigger, better version of the original Fugoo, which makes it one of the best Bluetooth speakers we've encountered to date. Last year we reviewed the first eponymously named speaker from Fugoo – specifically we looked at the Fugoo Style. The speaker’s unique jacket system might have been the most eye-catching part of its design, but we were quickly won over by the excellent sound and massive 40-hour battery life. At CES we got a glimpse of the follow-up, the Fugoo XL, and couldn’t wait to get our hands on one. Now that time has come. Like the original Fugoo, the Fugoo XL uses the same jacket system that sees a core speaker paired with one of three jackets. We’re looking at the Fugoo Sport XL, but the bulk of our findings in this review apply to all models of the Fugoo XL. Opening up the box, the first thing you’ll find is the Fugoo Sport XL speaker itself. Beneath is the quick start guide, which lies on top of a box containing the rest of the accessories. Inside the accessories box are the AC adapter and power cable, a USB cable, and a 3.5 mm audio cable. If you’ve seen the original Fugoo, the XL models will immediately seem familiar. The general look of the Fugoo Sport XL is very close to the original Fugoo sport, just nearly four times the size. Even the trim around the speaker’s edges is sized up, as if someone simply help a magnifying glass to the original. We’re not complaining – from the beginning, we’ve been fond of the Fugoo look. While we’re looking at the Fugoo Sport XL, either of the two other jackets, the Style and Tough, will work with the same core. It’s possible to buy these separately and swap jackets out on demand. Each jacket for the XL core is IP67 rated. This means that in addition to being dust-proof, mud-proof, and snow-proof, the speaker can be safely submerged in up to 3 feet of water for up to 30 minutes. Additionally, both the Sport and Style models float, making them great options to bring to the beach. That said, the XL speakers are definitely on the upper side of portable. Not only are they roughly four times as big as the original Fugoo, but they’re on the heavy side – just over 4 lbs. in the case of the Fugoo Sport XL. The Sport XL can take a drop – Fugoo says that it’s drop tested from 6 feet on all sides and angles – but optional wrist and shoulder straps are sold separately. Bluetooth is version 4.0, and while NFC isn’t present, pairing is still very simple. The friendly voice assistant from the original Fugoo is still present to give feedback on pairing, battery life, and powering on and off. If you’d rather plug in or you’re playing music from an older device, a 3.5 mm input is available. Range is stated as the standard 33 feet when you’re operating the speaker indoors. Outdoor range is stated as up to 120 feet. While we didn’t test the upper limits of this range, we had no problems playing music from 50 feet away during an outdoor test. Looking at the controls, the power button and Bluetooth buttons are located on the side, with everything else on top of the speaker. Unlike the original Fugoo, the XL offers playback controls with skip controls and a play / pause button that also switches the speaker between its “Normal” and “Outdoor” modes when held down for three seconds. Next to the playback controls are the volume controls as well as a multifunction button used for interacting with Siri, Google Now, or Windows Speech. We didn’t test this feature extensively, but basic Siri functionality worked fine with a simple tap of the button. The XL series features full-duplex speakerphone support, with an omnidirectional mic and echo cancellation. Call quality was good, in line with what we’ve seen in most other speakers in this price range that offer speakerphone. Fugoo claims a battery life of 35 hours for the XL series – something we’d balk at if we’d never encountered the 40-hour battery life of the original. Specifically, Fugoo’s claim is 35 hours at 50% loudness. We’ll get to the sound in a moment, but that is still fairly loud for this speaker. Our testing varied, but playback time was certainly very close to Fugoo’s claims. Time to recharge the battery is roughly 3.5 hours. Some might be disappointed to find that the AC adapter is required in order to charge. While there is a micro USB port present, this is used for firmware updates, not charging. In this case, this is understandable as the 37 Watt-hour battery would take quite a while to charge via a USB connection. On the other hand, a full-sized USB port is provided to charge mobile devices up to 1A, which is always nice to see. Like the original Fugoo, the Fugoo XL series speakers provide 360-degree sound. While the original smaller speaker used a total of six drivers, the XL speakers use eight: four tweeters, two mid/sub drivers, and two passive radiators. Combined, these drivers offer a frequency range of 50 Hz to 20 kHz. Unlike the original, the XL offers two different sound modes: “Normal” and “Outdoor.” Fugoo simply says that the Outdoor mode provides “richer, fuller” sound. To us it seems like this mode adds some compression to reduce the peaks and valleys in volume, trading some dynamic range for better audibility in outdoor environments. In testing the Fugoo Sport XL, we found it to offer the most bass we’ve seen in a speaker its size short of the sadly overlooked TREK 360 from TDK Life On Record. Unlike some other speakers (we’re looking at you, Bose) the low end doesn’t feel artificially inflated or booming. Instead, definition is excellent, providing solid lows without muddying up the low mids. The midrange is rich and full throughout the spectrum, avoiding the boxy sound present in so many Bluetooth speakers – but we expected that after testing the original Fugoo. The mids are not cut, nor are they inflated to boost apparent volume. Orchestral music showed this off well, with plenty of depth and body to instruments like cello and piano. Waterproof speakers often suffer in the high end, sounding like they’re covered by a blanket, but we did not find that to be the case with the Fugoo Sport XL. Fine detail was preserved nicely, but never became piercing. High notes on violin were just as present as lower notes, but never became shrill. Some Bluetooth speakers make a vague attempt at stereo, but most opt to provide mono sound, since stereo is hard to make out from such a small source anywhere. Fugoo makes a point that the XL series speakers actually provide stereo sound, and this is true. While testing the Fugoo Sport XL we were able to make out stereo details, albeit at short range – you’ll need to be fairly close to the speaker to hear stereo separation. Looking at the overall sound, this is a big sounding speaker, even at lower volumes. Crank the volume up and it sounds huge. Even pushing the volume up, we didn’t notice audible distortion until we were near the maximum. While the original Fugoo wasn’t loud enough for some, we doubt that will be an issue with the XL series. 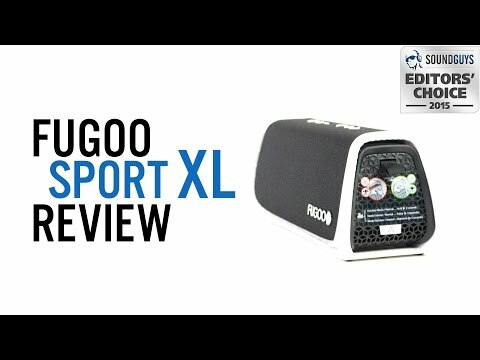 Coming into this review we had high expectations based off of our experiences with the original Fugoo speaker. The Fugoo Sport XL met or exceeded every one of those expectations. While many tough speakers use said toughness as an excuse for sub-par sound, the Fugoo XL competes toe-to-toe with any speaker in its class, rugged or otherwise. In a nutshell, this is a bigger, better version of the original Fugoo. That alone makes it one of the best speakers we’ve reviewed to date. The price may put some off, but if you’re shopping for a speaker in this price range, this absolutely needs to be on your shortlist.